T. baccata is a medium-sized bushy evergreen tree or hedging shrub with narrow, leathery, very dark green leaves arranged in two rows on the shoots, and insignificant flowers followed on female pla..
What wonderful shades of green! 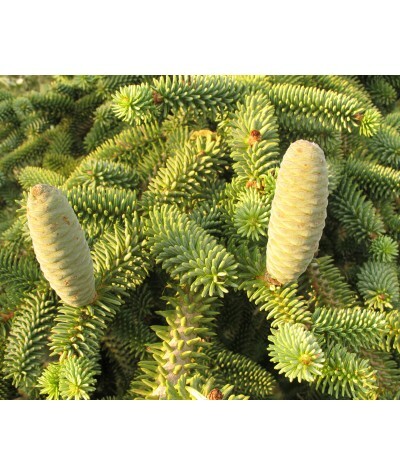 Compact, dwarf, dark green shell shaped sprays of foliage, with an uneven conical habit. Ideal for use in a rockery. 10 Year height = 1-2ft (30-60cms). Slow growing ..
A beautiful smaller growing form of the Japanese cedar tree with lovely feathery foliage turning bronze & orange in winter. Any good garden soil in sun or part shade. Height in 10 years to arou..
Upright columnar shaped yew with dense, very dark green needle like foliage. Small edible red fruit encase poisonous seeds. Any well drained soil in sun or shade. Eventual height and spread to arou..
Upright columnar shaped yew with dense, deep green needle like foliage. Small edible red fruit encase poisonous seeds. Any well drained soil ijn sun or shade. Eventual height and spread to around 9.. Narrow, upright columnar tree with vivid blue green foliage. Height to around 2-3m with a spread of about 60cm. Perfect as a small feature tree to frame doorways, paths etc. 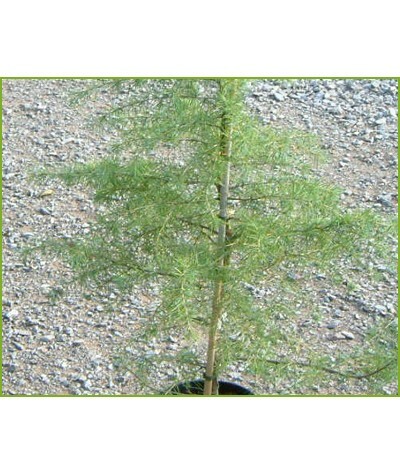 Any good, well drai..
Korean fir. Cylindrical cones are dark violet blue above shiny dark green leaves with white undersides. Broadly conical in shape with a height and spread to 12m+ x 6m+. Best in neutral to acid soil.. 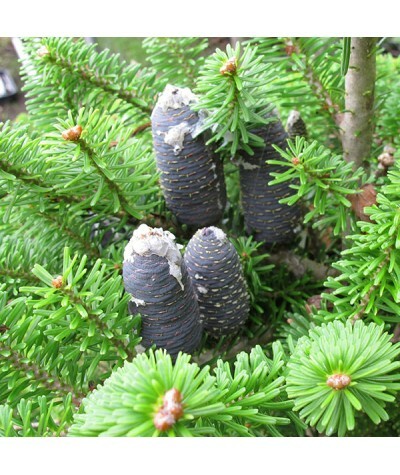 Dwarf Korean fir. Grows very slowly to form a lush low green mound to around 25cm in 10 years. Ideal for rockeries where a dwarf eventual size is desired. Rare. 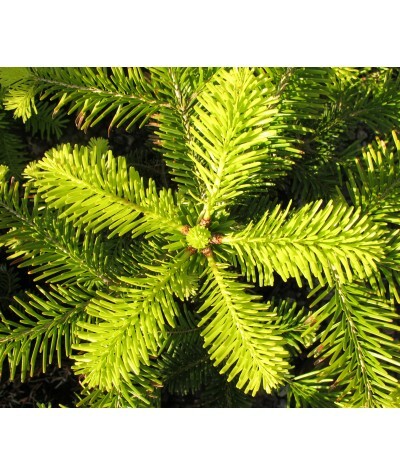 ..
Nordmann fir or non needle dropping Christmas Tree. Large tree with tiered branches of glossy, rich green leaves with white undersides and greenish brown cones. Any reasonable soil in sun or light ..
Blue Spanish Fir. 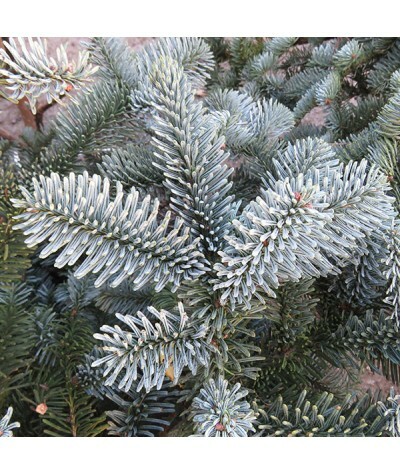 Slow growing specimen tree with rigid layered branches adorned with short, stiff, powder blue needles. Clusters of red male pollen flowers in spring and fat cylindrical glau..
Blue Noble Fir. This is a magnificent tree with steely blue branches and red flowers then blue cones that mature to brown. Initially very slow growing but growth accelerates as it becomes estab..
Deodar cedar. The largest of all the cedars. Native to the western himalayas this tree can reach heights of 200ft (60m) with a spread of 30ft (9m). It has a spire like crown often with lower branch..